You are either walking in truth or walking in lies. Categories: Repentance, Videos | Tags: angst, blessing, Christ, End Times, Faith, God, Jesus, Judgment, Love, peace, power, repent, repentance, Rest, stress, tribulation, truth, unrest, Word of God | Permalink. Hebrews 4:7-8 again He designates a certain day, saying in David, “Today,” after such a long time, as it has been said: “Today, if you will hear His voice, Do not harden your hearts.” For if Joshua had given them rest, then He would not afterward have spoken of another day. There remains therefore a rest for the people of God. For he who has entered His rest has himself also ceased from his works as God did from His. Hebrews 4: 11 Let us therefore be diligent to enter that rest, lest anyone fall according to the same example of disobedience. 12 For the word of God is living and powerful, and sharper than any two-edged sword, piercing even to the division of soul and spirit, and of joints and marrow, and is a discerner of the thoughts and intents of the heart. 13 And there is no creature hidden from His sight, but all things are naked and open to the eyes of Him to whom we must give account. Categories: End Times, Fruit of Holy Spirit, Videos | Tags: eternal life, Faith, God, Jesus, know, Love, power, Rest, righteousness, truth | Permalink. When Jesus knew His Hour had come, He kneeled down and humbly washed His disciples’ feet with the towel that was girded around His waist. The disciples didn’t understand … but would. John 13:7 What is the meaning of this beautiful act by the true King of Kings to those who followed Him? Christ died so that His Spirit of liquid light could consume us, purge all darkness, and transform us into holy eternal creations, thus bringing us into reconciliation/unity with God. At His death, Christ’s eternal spirit penetrated death of the true grave; the spiritual sepulcher of the flesh body that’s cloaked in sin. Romans 8:3 On the last day (the Day of the Lord, the Revelation of Jesus Christ), His Spirit would resurrect in the souls of mankind bringing them into eternal life. In this resurrection, sin, thus death, would be defeated in us forever. John 12:23-25 His Spirit rising in us is the true breath of life, the purest of love and truth, imploding our souls. 2 Peter 1:19 This filling of Him in us is the coming of His righteous kingdom to earth. Luke 17:21 It’s the salvation of our souls from death and all that it produces; pain, suffering, hardship, unkindness, and fear. This is the true salvation. And His hour has come once again, thus the need for Him to wash our feet. The girded towel represents truth. Ephesians 6:14 Now that the seed of Christ’s spirit is rising within us, it has to be combined with the truth. When spirit and truth meet within our soul, then new life grows within us. Our souls then become the living stones of the kingdom of God. The truth flows from this seed, for Christ is the word of God, the truth. He is the blood and the flesh. He is the wine and the bread. All these are symbolic of Him being the spirit and truth that when they come together within one soul produces life. As Christ spirit rises in us, we perceive it as a cleansed and purified conscience. Hebrews 9:14 When our conscience is pure, then we can discern between holy and profane. We can walk uprightly, thus we can abide in the truth of God and His transcendent all-powerful love. But we have to listen and obey (walk) His inner counsel to us, which we do by His power in us. When we do listen and obey, we walk in paths of righteousness and we become righteous. This obedience is allowing Christ to wash our feet; feet representing the path we walk. If Christ does not wash our feet, we have no part of Him. If we are not heeding Christ’s wisdom of truth being spoken to us from within (all in harmony with the Word of Truth as Taught by GOD), then we have no part of Him. Not only do we remain unrighteous, but we dismiss the very purpose in which He came; to be the door and the light by which we walk out of the pit of death and into eternal life. Though that seed is within us, it won’t take root. It won’t grow without following the wisdom of God. The tares of wickedness take over. We remain as we’ve always been, bound in the darkness of sin. In this state, great tribulation awaits as the Truth is coming as a flaming fire to reveal all the works of darkness and destroy all that is not of it. If we do heed Christ’s still small voice of truth guiding in the paths of true love, for that is what it teaches us to love ourselves, God and others, then we will be changed into eternal creations of the purest of love. Therefore, if Christ is washing our feet, we are growing in true love every day. One note, our love has been exceedingly abundantly corrupted by this world. Religion has proliferated hypocritical love, blinding people further to the lack of God’s true love in their lives. This world has amplified lust and judgment that fills people’s conceptions of love. Therefore, this isn’t as easy or straightforward as it may first appear. As we listen to the spirit of wisdom, we’ll find it’s a love far purer and beyond anything we’ve known. To walk in a life of true love, we require His detailed instruction (wisdom) until we become the truth we hear. Therefore, it isn’t following our preconceived notions of love; it’s seeking God’s love by having a constant listening ear and an attentive soul to His ways. Thankfully, it’s God’s will that we have this unity in Him, and His grace is more than sufficient to make us into His vessels of love as we are willing to follow Him. Have you allowed Christ Jesus to wash your feet? Do you daily seek, listen and walk according to His whisperings of wisdom (love) to your heart? Or do you walk according to the dictates of others, religion, the world’s wisdom, and your own imaginations? There is only one way to be a part of Christ, to let Him wash your feet; to listen to the spirit of wisdom within you and allow His spirit to create your soul in perfect truth and love. Categories: Obedience, Salvation | Tags: Bible, Christ, conscience, Day of the Lord, disciples, eternal life, gospel, holiness, Jesus, joy, Love, new creation, peace, purity, Rest, righteousness, Salvation, second coming, truth, wash feet, Word | Permalink. Talking about the chastening of God for the purpose of establishing His kingdom on this earth. All will learn righteousness .. and I talk a bit about that process. Categories: End Times, Salvation, Videos | Tags: Bible, chastening, cross, Day of the Lord, discipline, End Times, Faith, God, Jesus Christ, joy, Love, Path of life, redemption, Rest, Revelation, righteousness, Salvation, Saved, tribulation, truth | Permalink. Don’t let the picture fool you, this is a VERY IMPORTANT truth to understand. There is a saying around our house when we think we are doing anything to “help God out” that reminds us it’s all Him and nothing of us; we’re just making cookies. Anything “good” or “useful” we do for God is Him working in and through us and not us at all. As a young girl, I loved helping my mom bake cookies; especially my much needed role as taster <smiles>. In my young mind, I believed I was a much greater help than I actually was. It was ALL my mom’s doing. Yet, my mom graciously allowed me to delight in the fun of baking with her. She gave me little tasks to do like stirring the ingredients together, which she always gave a few extra swirls. Yet to me, I was making some of the best cookies in the world! She encouraged me in “helping” her because it was a wonderful bonding time for the both of us. She wanted me to “help”, but it wasn’t for my amazing assistance but because she loved me and took pleasure in making them together and seeing my joy in playing a part. We are like the child who is helping their mom make cookies. We don’t do anything of good on our own; it’s all God. He lets us take part because it’s a delight to Him and us. We are able to do what we do because He is governing, directing and performing all things for us. We can’t throw God off; we won’t mess up His plans; and He works out all perfectly. In every action and word, as His offspring we can trust He is faithful in directing and using us according to His ways, which are not our ways. 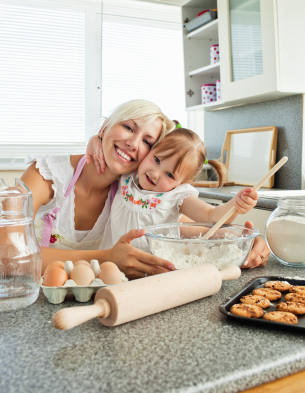 “Making Cookies” serves to remind us, we are not to be crafting our own righteousness, because we can’t. A twisted truth derived from the religious community is how we serve God. We want to be serving, working and doing for God because deep down it makes us feel like a better person; which is establishing our own righteousness. Instead of wholly relying on the righteous of God to fill and govern our lives, we are relying on ourselves. God is spirit. We are flesh and spirit. To experience God in the flesh, we have to allow our spirits to be united, influenced and governed by Him. When we do, His nature manifests in our lives in the forms of peace, rest, power, joy, blessing, and righteous love. Our part is to abide in unity with God. In fellowship with God that leads to unity, we are listening, obeying and gaining trust to relinquish all control to God’s ways and work. As our self-will steps aside, He runs our souls and lives. We cease to judge and work and He governs. If I didn’t bake cookies with my mom, then I wouldn’t have taken part in that bonding time with her or the fruit of our interaction, yummy cookies. God moves through us. But any goodness or good works are of Him, not us. Big difference. Are you getting it? Being attached to the vine and God moving through us as He wills is central to abiding in His rest. Hebrews 4:9-11 At rest, our self-will is nullified, and God’s will is ruling. We cease from our works and God works. In this rest, the power of God flows. You see the true power of God, when you stop efforting and let Him work. To be governed (also used by) by God is to let go of all control, and let God determine each step; steps often counter to what you, religion, or the world would dictate. It’s letting go of all images of who and what you should be doing, and let God direct you daily. It’s following His still small voice, daily. Your life is His venue to work as He wills in you and others. In this our lives become a living sacrifice. Romans 12:1 In this state, we lack the awareness of what our left hand is doing from the right. Becuase its not us, but God. This framework removes self-righteousness, because you aren’t doing anything but obeying His voice. It removes fears that you aren’t doing enough or did or said the wrong thing. In this truth, our hearts overflow with peace, praise and joy. So delight in making cookies and don’t make any more of it. Categories: Fruit of Holy Spirit | Tags: Bible, eternal rest, fellowship God, fruit of Holy Spirit, fruit of spirit, God, God's righteousness, Jesus Christ, Love, Power of God, Rest, self righteousness, serving God, spirit of God, Trust, truth, vine, worship | Permalink. In this video, I discuss a very important truth of entering into God’s rest. Categories: Repentance, Salvation, Trust, Videos | Tags: eternal life, Faith, God, Hope, Jesus Christ, peace, Rest, sabbath rest, truth | Permalink.